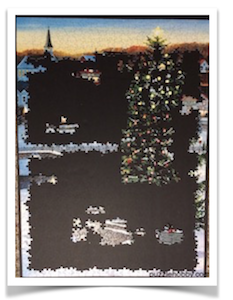 Looking for a holiday hobby jigsaw puzzle? Take at look a this Christmas Village Tree I have just recently completed. 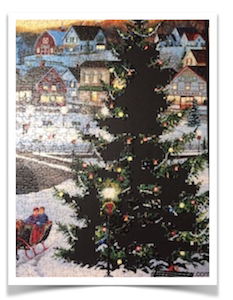 There's 32 Christmas jigsaw puzzles to choose from at Cobble Hill Puzzle Company and now they have added 2 NEW ones for 2017! 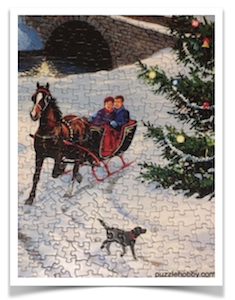 Which one will you add to your holiday hobby jigsaw puzzle collection? I feel privileged to be the first to present to you these NEW 2017 Christmas versions and maybe they will be your choice in the New Year. I have completed the 'Village Tree' and I am going to assemble the 'Christmas On The Farm' next. 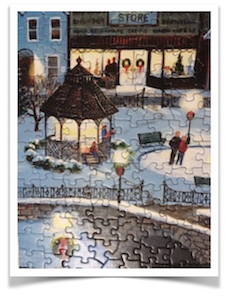 I had a few holiday hobby jigsaw puzzles selected to do this Christmas however when these arrived at my door last week they instantly captured this season's 'hot-spot'! 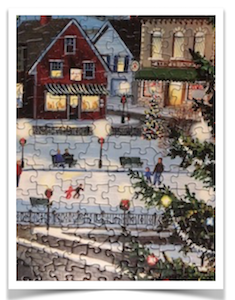 After all....just look at them....I know with ALL my will-power there is no way I could resist doing them....I admit - I have a HUGE weakness for Christmas jigsaw puzzles and a brand NEW Cobble Hill just seizes my attention like a magnet. 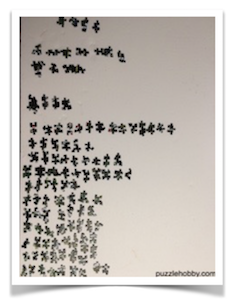 The first one, titled the Village Tree, was such a delight to complete. 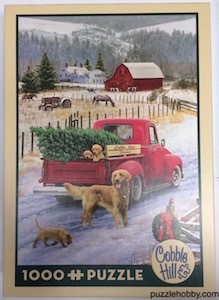 The Artist is Persis Clayton Weirs, it is 1000 pieces and measures at 19.25" x 26.625" OR 48.9 x 67.6cm. 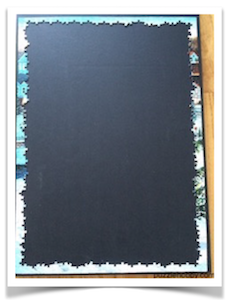 It's a perfect holiday hobby jigsaw puzzle. 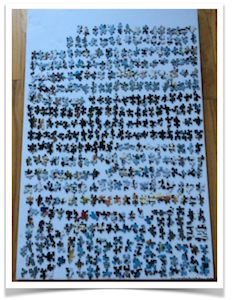 After sorting the main 7-8 colors into piles, then doing the border and the second round of sort/layout onto the other boards, I determined the Christmas Tree would likely give me the most challenge. And I was correct (sometimes these things have been known to surprise me but this one didn't) however between lining up the lights and decorations into their 'general area' and paying a WHOLE lot of attention to the shapes of the pieces, I strived through it. 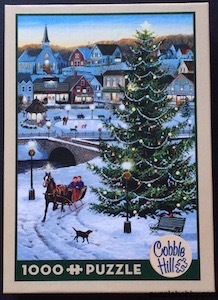 Puzzle SORT/LAYOUT - The Village Tree - Cobble Hill Puzzle Company - 1000 Pieces - 19.25"x26.6.25"
Left TREE for LAST - The Village Tree - Cobble Hill Puzzle Company - 1000 Pieces - 19.25"x26.6.25"
TREE Pieces TO DO - The Village Tree - Cobble Hill Puzzle Company - 1000 Pieces - 19.25"x26.6.25"
DOING the TREE - The Village Tree - Cobble Hill Puzzle Company - 1000 Pieces - 19.25"x26.6.25"
Other than the Village Tree itself, the rest of the image was fairly easy to put together. It's very fun to see the decorations in the windows and the people at the skating rink. 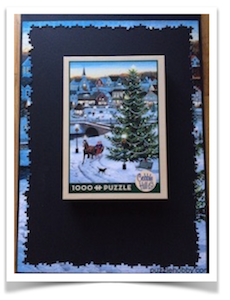 It certainly has all the makings of a great holiday hobby jigsaw puzzle including the quality of the board and the type of box Cobble Hill uses. One thing I have determined between some artist's paintings verses photos or digital imagery ......paint brush strokes are a little more trickier than a clean cut image but not too much more. All said above, I am really excited to share the Village Tree with you. 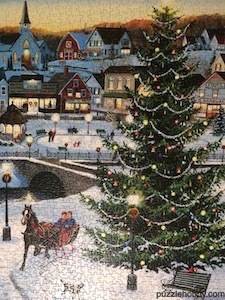 It only took about 12 hours to complete by a single person which makes it ideal for a family group to enjoy as a holiday hobby jigsaw puzzle. 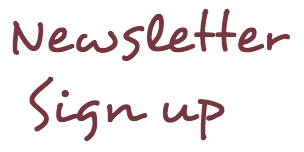 You can't really go wrong choosing a Cobble Hill jigsaw puzzle as they do produce top-of-the-line products.....that is not a marketing plug for them - it is my personal opinion. 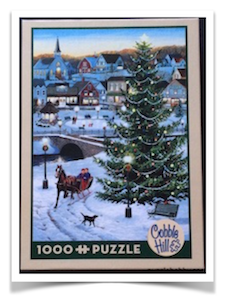 I consider Cobble Hill Puzzle Company products to be 'top-of-the-line' level. I have many included in my own jigsaw puzzle collection and I recommend the same for you too......Happy puzzling!